01-01-2017. The candidates who are interested to staff nurse in GMC should have completed degree (B. Sc nursing) or its equivalent qualification from a recognized university. 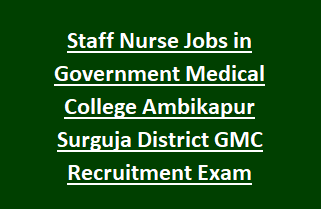 The candidates are selected for staff nurse in GMC ambikapur by conducting written exam. The interested candidates may apply by online mode. The last date for submission of application for GMC ambikapur jobs is 14-10-2017. For more details, see below given information . The last date for submission of application form of GMC ambikapur jobs is 14-10-2017. The age limit for those candidates who are applying for the post of staff nurse in GMC ambikapur is between 18 to 40 years as on 01-01-2017. The age relaxation will be applicable as per the rules. First the candidates are shortlsited for staff nurse jobs in GMC by merit list in 10:1 ratio. Shortlisted candidate will selected through the written exam marks. The syllabus for staff nurse exam is entire syllabus in Bsc (nursing) Degree.